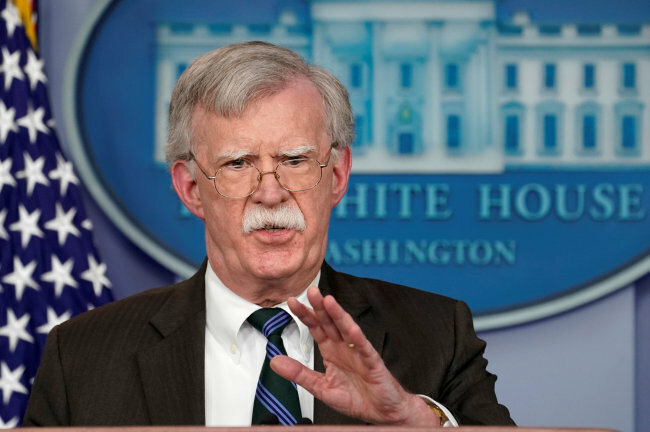 President Moon Jae-in and US President Donald Trump will hold a summit meeting on the sidelines of the G20 Summit in Buenos Aires, US National Security Adviser John Bolton said Tuesday. Moon, who is currently on a three-nation tour, will arrive in Buenos Aires Friday on a three-day schedule to attend the G20 Summit. In the meeting with Trump, Moon is likely to focus on North Korea-related issues, as he did in the recent meeting with US Vice President Mike Pence. In the meeting with Pence, held on the sidelines of ASEAN Summit in Singapore earlier this month, Moon stressed the need for cooperation between the allies, while Pence requested Moon to play a bigger role in Pyongyang-Washington communications, according to Cheong Wa Dae. Moon’s meeting with Trump comes at a time of little apparent progress in Pyongyang-Washington talks and concerns of a rift in South Korea-US cooperation on North Korea issues. According to reports, yet another round of high-level talks between Pyongyang and Washington has failed to materialize due to the North not responding to US’s request for the meeting. The proposed talks would have seen US Secretary of State Mike Pompeo and Kim Yong-chol, the vice chairman of the Central Committee of the North’s ruling Workers’ Party, meet in New York this week, according to reports. The Pompeo-Kim meeting falling through is also said to be affecting plans for working level talks involving Steve Biegun, US Special Representative for North Korea Policy, and North Korea’s Vice Foreign Minister Choe Sun-hui. The US Department of State denied related reports, with spokesperson Heather Nauert saying that there was no plan for a Pompeo-Kim meeting to her knowledge. Nauert also said that the US and North Korea were in “frequent contact” at both high and working levels. Despite the State Department‘s reassurances on Washington’s dealings with North Korea, there have been numerous reports of growing gap in Seoul and Washington‘s approach to Pyongyang. The US is said to have expressed concerns for inter-Korean relations outpacing denuclearization processes. Aside from the summit with Moon, Trump is set to meet with a number of leaders including those of Argentina, China, Germany, Russia and Turkey during his stay in Argentina. As for Moon, the trip to Argentina is second part of a three-nation tour, which began in the Czech Republic on Tuesday. From Buenos Aires, Moon will travel to New Zealand, where he will seek to strengthen bilateral ties, and ways to achieve synergy effect between his New Southern Policy and New Zealand’s policies concerning the Pacific region.